Use this link, then when you shop using AmazonSmile Amazon will donate 0.5% of the price of your eligible AmazonSmile purchases to the Irving J. Gill Foundation. 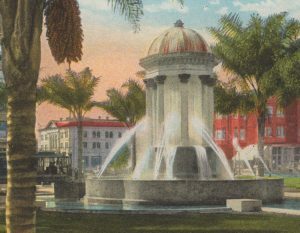 Irving J. Gill is well known for his pioneering efforts in finding new methods of construction that were sympathetic with his equally pioneering architectural aesthetic. One of many and well known, examples of this is his early adoption and experimentation with cement and tilt-wall construction. The Maybeck Award is an exceptional honor that is given to a limited number of California architects. Winners must show a lifetime of significant achievements, substantial contributions to the profession, and a body of work that is notable and influential. Gill meets all these criteria, and the judges voted unanimously for Gill to thus be honored. The following video features Gill’s architecture and is composed of portions of the application submitted by the Irving J. Gill Foundation to the AIA CC. It was first shown at Irving J. Gill: Transitioning to Modern, the Foundation’s symposium and celebrations held on April 26, 2018 in San Diego. The Gill Foundation submitted the award application on Gill’s behalf. 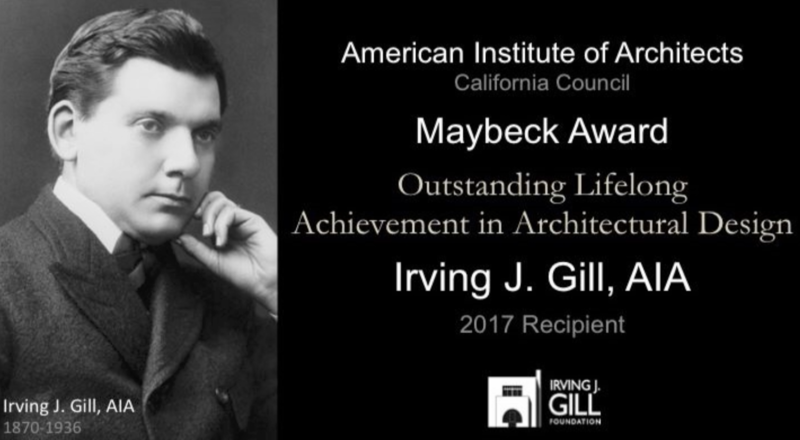 James B. Guthrie, A.I.A., president and founder of the Irving J. Gill Foundation accepted the award in Irving J. Gill’s honor at an AIA CC ceremony in Monterey, California on October 13, 2017. © 2017 Irving J. Gill Foundation. All Rights Reserved.